There are very few times where it’s actually safe and good for you to eat soy products here in the US. And, organic tempeh happens to be one of them. Tempeh is made by By fermenting cooked soybeans with a mold, while tofu is made by curdling fresh hot soy milk with a coagulant. Eating too much tofu has been known to mess with your hormones, and contain far too many GMOs, additives and preservatives to make it healthy. 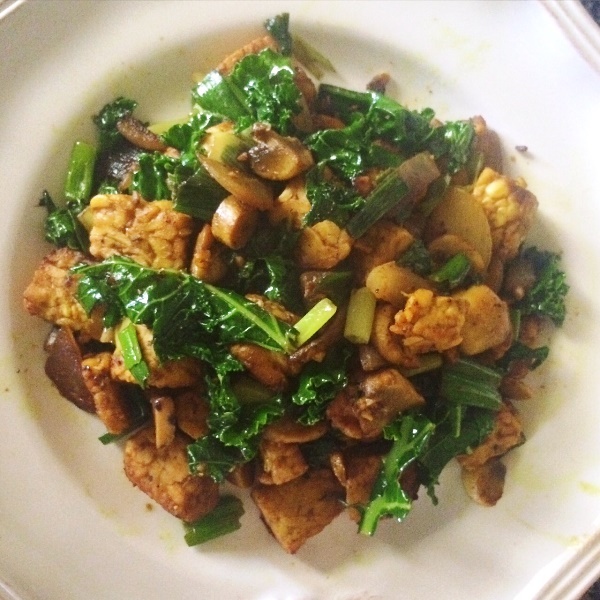 Tempeh has slight earthy taste, while tofu tastes like…not much at all. As far as nutritional value, Tempeh is 160 calories per half cup serving compared to tofu at 97, however, tempeh has a 15.5 grams of protein per half cup and 3.5 grams of fiber compared to 10 grams of protein in tofu and .5 grams fiber per half cup. All in all, tempeh is a better choice! 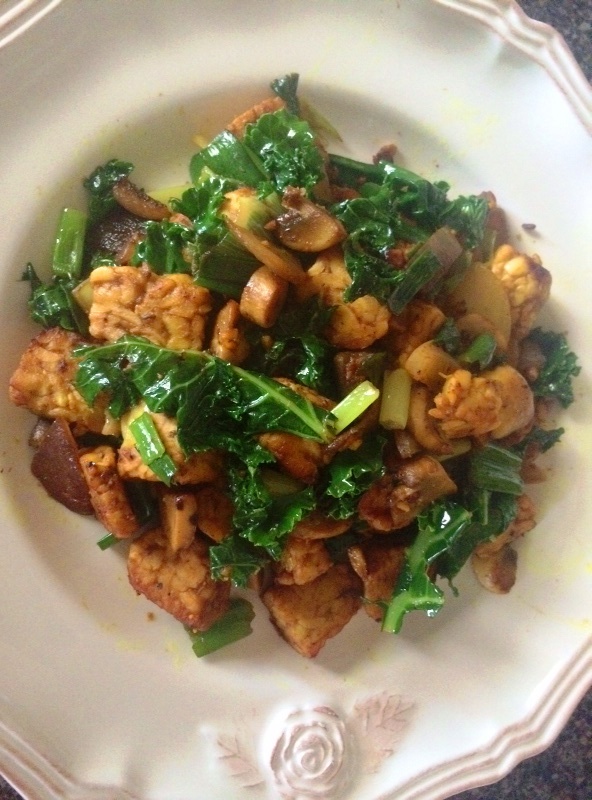 This meal can be made with any tempeh. I have tried it with original tempeh, tempeh with flax seeds, and chickpea tempeh, which I highly recommend! This dish is a vegan’s dream, and with the right amount of sauteeing and flavor, this dish will turn into your favorite as well! Sautee the garlic first with 2 tbsp of coconut until golden, then add the tempeh. 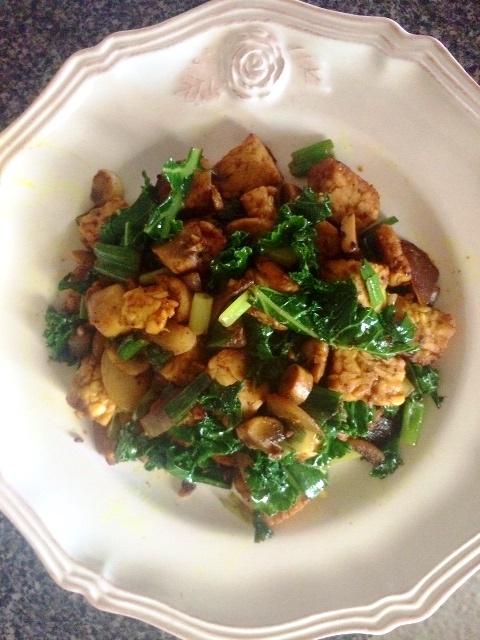 Cook until tempeh is brown on all sides, then add the mushrooms and onions, and cook some more, about 2 minutes. Add the green onions, tamari, worschestshire sauce, turmeric and onion powder, and add the remaining tbsp of coconut oil. Once everything is mixes, rip up the kale leaves and cook them briefly, enough for the leaves to wilt, but still retaining their color. Once everything is in the pan, turn the heat off and mix again, then set aside to cool. You can serve this dish with noodles, a side of avocado, or you can eat it by itself, like I did!